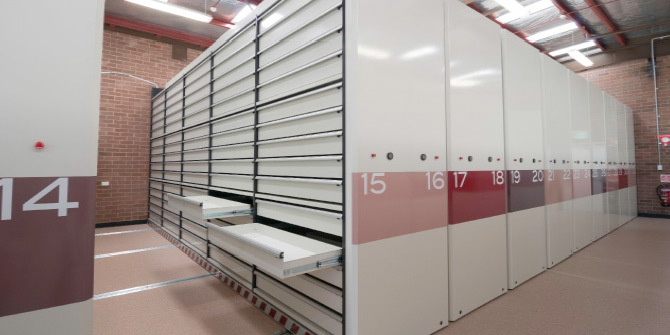 CSIRO sought sophisticated mobile shelving from a suitably qualified and experienced company that could provide detailed design, manufacture, installation and commissioning of a rolling storage system for the CSIRO National Soil Archive in Building 208 at Black Mountain, ACT. Bosco Storage Solution was chosen as the preferred supplier. The proposed system combines elements of two core product groups, Maxitek and Boscotek. Maxitek shelving system is German design and engineered that is manufactured under license, by Wilson & Gilkes in Australia. It has many key features that make it a suitable choice for this application. These features include, Mobile Basements, Bearing Wheels, Track & Rail System, and Electrical Motor/Control & Mechanical Drive. Boscotek is designed and manufactured in Australia by Wilson & Gilkes. Boscotek is a high density drawer storage system. It includes a unique drawer system specifically engineered to take heavy drawer loads for the tool and small part storage markets. Boscotek high density storage systems was ideal for the soil sample application. The drawers hold capacities of 120kg and 200kg UDL and have been cycle tested to over 150,000 operations, without failure. Using flexible manufacturing and engineering capabilities Wilson & Gilkes merged these two products to create an ideal solution for the CSIRO. Not only did the solution meet the requirements and the needs of The CSIRO, it also provides a tested and proven custom solution with a faultless record. The Maxitek mobile rolling system held container samples in plastic bottles, 2kg weight per container (44 plastic containers per drawer). The system contains a total of 3300 drawers. Total soil sample capacity is 145,200 plastic bottles. CSIRO are extremely satisfied with the performance and service of Bosco Storage Solutions and the range of quality rolling storage products.